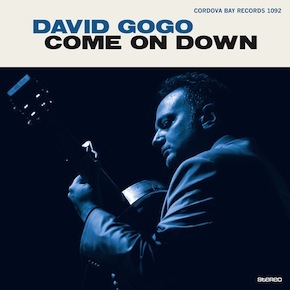 I just received a copy of the newest release, Come On Down, by David Gogo and it's a rocker. Opening with Faces track Bad "n" Ruin, Gogo sets the pace for the release with searing slide work. On title track and original tune, Come On Down, Gogo captures sounds of the south with influences of the mountains and the swamps. Another original track, Call Your Name, has a rockin beat. Directed primarily at airplay the track has a nice hook and paired guitar leads. Worth It has a strong R&B sound with backing vocals by Tina Jones, Amber Handley, Shelley Beeston and Ken Ermter. Clean country influenced blues riffs highlight the track. Natchez Dog has a cool low slung blues feel with Shawn Hall on harp and Gogo on acoustic slide. Kings is an electric blues rocker with solid bass and crisp drums. Reminding me a bit of a Glenn Frey track, this is another track if promoted right could easily gather substantial air following. Grinding guitar work and simple drum rhythms also are strong compliments to this track. Atlanta Rhythm Section hit track So Into You is covered here with a bit of R&B grease and backing vocals. This track was large a umber of years ago and now with Gogo playing a hot guitar riff on top of a newer arrangement could easily do it again. Gogo original Blue Eyed Daisy is a hard driving rocker with some white hot flaming guitar riffs. Ashford and Simpson classic, Let's Go Get Stoned, gets a real nice blues treatment not only providing a nice bed of rhythm for Gogo's best vocals on the release but also some terrific blues guitar riffs. Really nice. Taking another direction, Gogo covers Robert Palmer's pop track Looking For Clues. keeping with the original uptempo and underfunk, Gogo adds some understated but slick guitar riffs throughout the track. Christine McVie's Spare Me A Little has a nice soul/R&B groove which is preserved. Vocal duet work and soulful guitar work makes this a memorable track that Gogo made his own very nicely. Completing the release is Lindsay Buckingham's World Turning. Maintaining the original tempo but spicing it up substantially with super slide work takes this from a traditional pop tune and makes it a nice blues interpretation track with multiple faces. Harp solos by Hall and slide solos by Gogo make this another hot track for the blues lover. I'm guessing the "Hall" on harp is Jimmy Hall? I wish !! But just as good , it's Shawn Hall from Canada's buzz blues band , The Harpoonist and The Axe Murderer . Shawn Hall pal...but good guess!